I am Zara Reboton Alvarez, a single mother of a three-year-old child. I am an activist, a former chairperson of ANAKBAYAN-Negros, Deputy Secretary General of BAYAN-Negros, Campaign and Education Officer of KARAPATAN-Negros and a current Staff of the North Negros Alliance of Human Rights Advocates (NNAHRA). I am languishing in jail for more than three months already. I was arrested for the charges of murder for my alleged involvement in the death of 1st Lt. Archie Polenzo of the Philippine Army on March 7, 2010. My name was added through an amended resolution dated July 31, 2012. After a witness reportedly under the military protection surfaced on May 15, 2012, and supplied my name and that of Anecita Yaun Rojo, a church worker. I was arrested last Oct 30, 2012 at around 6pm in front of Cadiz City public market. More than 30 fully armed men, a composite of Special Action Force (SAF) and members of the 62nd IB, joined later by members of the Philippine National Police (PNP) Cadiz City. I am charged as ordinary criminal by the government although I am a political prisoner and I am being persecuted because of my political belief and primarily because of my commitment to human rights. Wherein I myself become a victim of the cause I am espousing. Being locked up in a prison cell, deprived of my liberty, could not hinder me in cultivating freedom from injustice. In this, I am appealing to you, to the national and international human rights organizations, to the United Nations to remain steadfast in your support for human rights defenders. Many are still languishing in jail and a lot who are threatened to face the same situation like us. Now being imprisoned here in the high walled compound surrounded by the barbed wires, being put behind bars, our only hope lies upon the solidarity and support you can possibly extend. Your solidarity to us during this darkest period of political persecution and legal harassments will concretize the concept of universality and correctness of our struggle in and outside the prison cells. 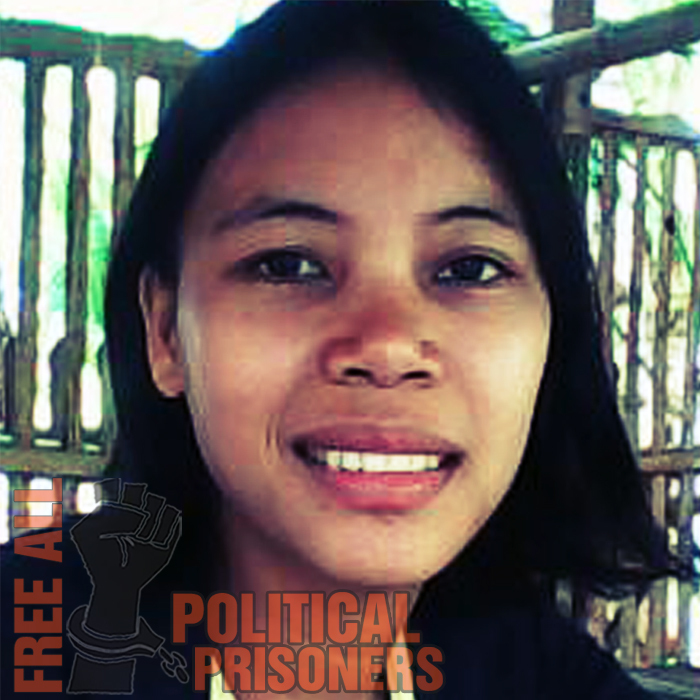 I am heartily praying that I will be released from detention together with the other political prisoners the soonest possible time so that I can rejoin my child who longs for my care and be back to our home, to my family and friends. And that I also pray to put an end to the trumped-up charges and all human rights violations. Keep your strength and your faith. The truth will win! Kaisa mo kami sa iyong pakikibaka. Nawa’y higit pang patatagin ang iyong paninindigan at palakasin ang iyong pagkapit sa prinsipyong ating ipinaglalaban para sa kapakanan ng sambayanan. Mabvuhay ka! Kasama ang katawan natin pwdeng gapusin at ikulong ng kaaway pero ang ating isipan ay hindi kailan man pwdeng itali ng kaaway….